Not only has the imaginary kilted boy followed her to Alloway, she and Mackenna uncover a strange set of rings and a very unnerving letter from Mackenna's great aunt — and when the girls test the instructions Aunt Gracie left behind, they find themselves transported to a land that defies explanation. Doon seems like a real-life fairy tale, complete with one prince who has eyes for Mackenna and another who looks suspiciously like the boy from Veronica's daydreams. But Doon has a dark underbelly as well. The two girls could have everything they've longed for... or they could end up breaking an enchantment and find themselves trapped in a world that has become a nightmare. Summary sound familiar? The premise of Doon is loosely based on the musical Brigadoon. And while I have never seen this before, I'm guessing some of the more thespian-oriented readers among us probably have. I'm not actually sure whether this would have been better or worse. 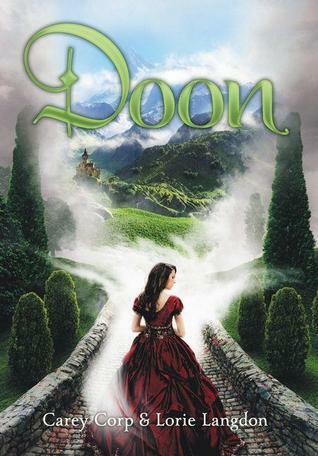 I'm a bit conflicted about Doon, because on one hand, I liked the premise and I found myself wanting to keep reading it, but on the other hand there were a couple of things that made me want to throw my e-reader across the room and roll my eyes and make lots of frustrating noises. What I liked: I liked the storytelling, the overall plot is interesting and fairytale like and it worked. What I didn't like: I was confused by one of the lovestories, because the prince was being a jerk and I just couldn't see it. Veronica's parental situation was crazy and for me unbelievable, it was a bit of a too conventient absent-parent thing. The constant fangirling of Veronica and Mackenna over each other was really annoying. I'm not entirely sure this needed to be a series and I'm still debating if I want to read the next book or not. There were too many things that annoyed me and not enough great moments in between to compensate. I am sorry that the book was frustrating for you. I am glad that you reviewed it though, because the summary sounding interesting; however, that drove you crazy about the book would have driven me crazy too. Great review. Haha, is it fair to judge a book by its goodreads summary? I don't follow goodreads too much, so I don't know if it is. But, there were alarm bells for me due to the following progression: 1. She keeps seeing an imaginary boy 2. She thinks Scotland will be an escape from it and 3. The "imaginary kilted boy" followed her. She thought that going to Scotland would help her escape an imaginary KILTED boy...huh? Too bad, premise did sound interesting. I might read it anyway- it's easier to learn about good writing by reading not-so-good writing, I think. Thanks for the review! I was thinking the exact same thing about the kilted boy going to Scotland.... um duh?! Awhh D: Sorry you didn't like it more! Better luck next time! !